Andrew Brunson is an American pastor and missionary from North Carolina who has been living in Turkey and preaching the Good Word for more than twenty years. His services were curtailed in October, however, when he was arrested by Erdogan’s goons and he’s currently in prison facing “terrorism” charges. Throughout this ordeal there has been little to no help from the Obama administration and now the pastor’s family has reached out to the Trump transition team. The Daily Caller has the latest details. A Christian social activist group has been in touch with the Donald Trump transition team in hopes of freeing an American pastor who has been held in a Turkish prison for three months on bogus terrorism charges, The Daily Caller is told. “We’ve reached out, and they’re obviously aware,” Jordan Sekulow, the executive director of the American Center for Law and Justice, says of the case of Andrew Brunson, a native of North Carolina who has served as a missionary in Turkey for 23 years. “We haven’t seen the engagement from our highest level officials. They’re on their way out, and it doesn’t seem like necessarily it’s on their priority list,” Sekulow added of the outgoing Obama administration. The American Center for Law and Justice has been following this story from the beginning. Last month they published an extensive summary of the events to date which will bring you up to speed on Brunson’s situation. Unsatisfied and unconvinced by what he was being taught about evolution at Marmara University in Istanbul, Turkey, 21-year old student Enes Kayan knew there was another side which was never presented in his courses. So in 2012, Enes, a member of the Marmara Young Vision Student Club, decided to organize a symposium in which he and other Marmara students could hear alternative views on evolution, including intelligent design. The idea that evidence against Darwinism, and even for intelligent design, could be freely presented at a university angered some students and professors, and about 300 of them staged a protest, which Enes said actually worked to his advantage as it brought publicity to the event, which was held on May 16-17, 2012. 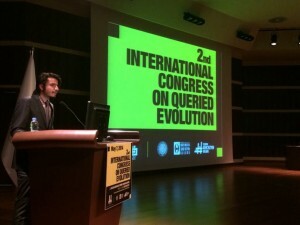 The event was such a success that Enes decided to organize a similar event the following year, and invite scientists from outside Marmara University, including some from outside Turkey, and the “First International Conference on Queried Evolution,” was held on May 4, 2013 at Marmara University. I was actually invited as one of the international speakers, but had to decline because the event was in the middle of the last week of classes at the University of Texas El Paso. The meeting was organized by Enes, and run entirely by students from Marmara Young Vision Student Club, who found sponsors to pay the expenses of the visiting scientists, including the Student Council of Turkey, a dependency of the Council of Higher Education of Turkey. The following year Enes organized a second international conference with the Erzurum Young Vision Student Club, this time it was held at Ataturk University in Erzurum in eastern Turkey, and sponsors included the city government of Erzurum and the university itself. Enes again invited me, this time I decided to accept despite the fact that it was again held in the middle of the last week of my classes, May 7, 2014. And so this year I was able to participate in the event and witness the work he and his fellow students had done in organizing it. The meeting was held in a large 550-seat auditorium at the Culture and Performance Center building and attended by over 600 students during the day. Since some of the talks were in English while others were in Turkish, simultaneous translation was provided by a student interpreter. I heard (through the interpreter) mentions of “specified complexity,” “the explanatory filter,” “irreducible complexity” and other familiar ID terms during some talks, but other speakers presented a range of different viewpoints, including at least one who defended the traditional Darwinist viewpoint. Most of the speakers discussed the origin of life and biological evolution, but one physicist centered his discussion on the fine-tuning of the constants of physics. Lecturers were invited from Celal Bayar University, Dokuz Eylul University, Yidirim Beyazit University, Ataturk University, Ankara, Edmonton, and London. My talk was entitled “The Common Sense Law of Physics,” here is the video that I created while preparing for the trip, which closely parallels my lecture. I enjoyed seeing Istanbul on the trip in, Enes and his girlfriend showed me the main tourist attractions, and I was especially impressed by Erzurum, which I found was a winter sports capital of sorts, even boasting a couple of large ski jumps near campus. Ataturk University, founded in 1957, now has over 70,000 students, with an attractive and modern campus. For me, the most amazing thing about this conference, which I hope will be continued next year (with the English translation of the title changed from “Queried Evolution” to “Evolution under Scrutiny” at my suggestion! ), is that it seemed to be as well-organized and well-run as any scientific conference I have attended, yet all of the organization and all the work was done by a group of 15-20 students. In fact, other than the invited speakers, I don’t recall seeing anyone who did not seem to be of student age. For a 23-year old student to undertake the task of organizing an international scientific meeting on any topic is quite an accomplishment, but for Enes and his fellow students to successfully organize a conference in which alternative views on evolution are presented is especially impressive. It has been said that when an old theory is replaced, it is often not because its adherents change their minds, but because a new generation embraces the new theory. I may have seen this principle in action last week in Turkey. Me: I wonder if these conferences may well serve as a harbinger of things to come. The evidential structure of biological evolution as currently taught is becoming increasingly weak and wobbly. The publication this year of Stephen C. Meyer's Darwin's Doubt with its focus on the unexplained "Cambrian Explosion" is another huge problem for evolutionists. Today I just read that a vertebrate fish has been found in the Cambrian Explosion!! Keep reading for more on that new find. WASHINGTON -- From Harry Truman to Barack Obama, U.S. administrations have long viewed Turkey as a key ally and force for moderation in the Muslim world. In recent years, however, Turkey has moved in a radically different direction: journalists thrown in jail, Twitter and YouTube shut down, and political opponents threatened with prosecution. It's the kind of repression usually found in places like Iran and Syria -- only now it's happening in Turkey, a NATO country with aspirations of joining the European Union. Under the leadership of Prime Minister Recep Tayyip Erdogan and his AKP party, Turkey has made clear that it is setting a new course -- one that places its interests far from those of the West. ANDREW C. McCARTHY - "LIBERTY AND SHARIA CANNOT SHARE THE SAME SPACE"
Andy McCarthy understands freedom, Islam, and sharia with a particular clarity rarely exhibited in Western journalism. His reflections on Turkey, and Islam in general, add greatly to a more mature and accurate understanding of Islam. I have highlighted sections I think especially worth noting. [...] Like all Islamists, Erdogan [Prime Minister of Turkey] has contempt for Europe and the West. The objective of Muslim supremacists is to dominate and Islamize them, not emulate them. . . But the fact is that Islamic supremacism is the preponderant Islam of the Middle East. Yes, it is a religion, but it aspires to be so much more: to control every aspect of life, to impose sharia’s political, social, and economic strictures on civil society. Therefore, the guidelines for religions that pose no threat to free societies cannot be applied to Middle Eastern Islam without putting liberty in grave jeopardy. In a truly free society, religious liberty is a bedrock. It must be safeguarded from governmental incursions. If, say, the Chinese Communists cared about such things (they don’t), it would make perfect sense to preclude them from integration with Europe until they ceased repressing religion (among other things). And we would have no hesitation about saying so, because Chinese totalitarianism is perceived as a political ideology, not a “religion.” Yet an Islamic society is not free precisely because of its religion — or, to put a finer point on it, because of its dictatorial sharia system, which we inaccurately describe as a mere “religion” due to the spiritual components that adorn its thoroughgoing regulation of non-spiritual life. I hasten to add that it is no insult to call sharia a “dictatorial” and “totalitarian” system. Devout Muslims believe Allah, omnipotent and omniscient, has ordained sharia as the template for virtuous human life — every detail of that life. In their view, it is profoundly offensive for His creation, to whom He has deigned to give this gift, to disobey. One need not be a believer to understand why sharia-adherent Muslims believe we must all submit. To grasp this, however, is to understand that liberty and sharia cannot share the same space. The US at the moment is perilously close to being used for the purposes of others, like a dying and dithering empire. In spite of the significance of the setback for Al-Shabaab in Somalia, to everything from the piracy problem to dominance in the Middle East, the US is nowhere to be seen in the strategic aftermath of this tactical victory. We have no idea what to do with it. But Erdogan does. [...] Turkey ranks 138th in the international media freedom group Reporters Sans Frontieres country index on press freedom. Sixty-eight journalists are languishing in Turkish jails for the crime of doing their job. The most recent round-up of reporters occurred in early March. And it is demonstrative of Turkey's Islamist leaders' exploitation of democratic freedoms in the service of their tyrannical ends. . . . In an interview this month with the opposition Hurriyet Daily News and Economic Review, former Turkish president Suleyman Demirel warned that the AKP has established "an empire of fear" in Turkey. TURKEY'S DESCENT into Islamist tyranny has not simply destroyed freedom in Turkey. It has transformed Turkey's strategic posture in a manner that is disastrous for the West. And yet, in this arena as well, the West refuses to notice what is happening. . . .
ANDY McCARTHY- WILL EGYPT FOLLOW TURKEY'S PATH TOWARD ISLAMISM? The question in Egypt is not what happens at noon tomorrow but what happens, incrementally, over the next several years. While some analysts look at Iran 1979 as their guide, mine is present-day Turkey. There, by law, the military is the guarantor of Atatürk’s secular Muslim society. Like Egypt’s armed forces, Turkey’s military is highly professional — indeed, it is still (nominally) a NATO ally and until recently had strong ties to the Israeli defense forces. Yet now, after 80 years, Turkey is back in the Islamist fold and overtly hostile to Israel. This did not happen overnight. The Justice and Development Party (AKP), a disciplined, well-organized Islamist faction with close ties to the Muslim Brotherhood, managed to squeeze into power in 2002, even though it was a minority opposed by millions of pro-Western, secular Muslims. It increased its popularity by foreswearing any intention to impose sharia, avoiding the taint of financial corruption, adopting responsible economic policies, and only gradually enacting items on the Islamist punch-list — beginning with the ones that enjoyed broad support. Behind the scenes, it used its power both to infiltrate the military and to install its loyalists in important institutions (e.g., the banks, bureaucracy, judiciary, and education system). The European Union is welcoming the outcome of the referendum in Turkey in which voters endorsed Prime Minister Erdogan’s proposal to rework the judiciary, a proposal which, a senior court official has warned, threatens the independence of the courts. The breakdown of the vote, according to press reports, is interesting. More European-oriented cities (Izmir, European portions of Istanbul, etc.) voted against the referendum, while the referendum was overwhelmingly popular among Turkey’s more Middle Eastern constituencies. Before they cheerlead for the false dichotomy that Islamism equals democracy and secularism equals fascism, European Union officials should take some time to consider why those Turks who most embrace European values rejected the amendments. I don't suppose many people who read this blog pay much attention to what is happening in Turkey, but ominous events continue to unfold in that country. Not only is an important referendum on constitutional amendments to be held Sept. 12th (offering the increasingly Islamist government an opportunity to tighten its noose), but the U.S. is about to sell Turkey it's most advanced aircraft without anyone in Washington even raising questions. It's extraordinarily dispiriting to witness a great nation (the U.S.), playing tiddly-winks and failing to mind the store. Michael Rubin has the story. Andy McCarthy, author of The Grand Jihad, says Turkey has become an Islamist state. He describes how Ataturk engineered Turkey to be a secular Islamic state. And he describes how the promise of EU membership and the democratic process have allowed the Islamists to takeover Turkey. Andy also says that the US-Turkey alliance is coming to an end. TURKISH AID TO GAZA SONG: "WE CON THE WORLD"
- Update 6/12/10 - YouTube took down the video. It can still be seen here. This week at Latma – the Hebrew-language media satire website I edit, we decided to do something new. We produced a clip in English. There we feature the Turkish-Hamas “love boat” captain, crew and passengers in a musical explanation of how they con the world. “There is no doubt he is our friend,” Turkey’s prime minister, Recep Tayyip Erdoğan, says of Iran’s president Mahmoud Ahmadinejad, even as he accuses Israel’s foreign minister Avigdor Lieberman of threatening to use nuclear weapons against Gaza. These outrageous assertions point to the profound change of orientation by Turkey’s government, for six decades the West’s closest Muslim ally, since Erdoğan’s AK party came to power in 2002. Joel Rosenberg has the story. Prime Minister Erdogan continues to emulate Vladimir Putin as he consolidates control in Turkey. Yesterday, after warning the news group to stop criticizing him and calling for a boycott of critical newspapers, his appointees slapped a $500 million fine on the Dogan Group. Meanwhile, wiretapping scandals continue and even Turkish diplomats say they are afraid to go to restaurants and talk about politics or policy openly as Turkey continues its slide into becoming a Middle Eastern-style police state. As the international media focuses on Gaza, trouble is growing in Turkey as the government continues to round up political opponents, academicians, and secular intellectuals on charges of alleged involvement in a plot against the government. (My background on the case, here). Michael Rubin writes persuasively of Turkey's precarious situation and the threat posed by Fethullah Gülen. One has to read Rubin's article to understand what is going on in Turkey. ** Stanley Kurtz writes on Dr.James Cone, a leading advocate of Black Liberation theology, and the mentor of Obama's pastor, Rev. Jeremiah Wright. ** Victor Davis Hanson takes a look at Rev. Jeremiah Wright's successor, Rev. Moss who "likens the media storm over Jeremiah Wright's racist and anti-American remarks to a lynching and crucifixion." Rev. Moss’s interviews and sermons concerning Wright suggest that he is in complete agreement with his former pastor’s views, and will continue to promulgate them, albeit perhaps with less profanity and slander. Daniel Pipes asks: "Turkey, Still a Western Ally? The recent transformation has happened so quickly that – formal NATO relations notwithstanding – Turkey can no longer be considered a Western ally. Nor, certainly, is it an enemy. Rather it falls into a middle status – like Russia, China, and Saudi Arabia -- of rival. One day it cooperates, the next it competes. Before long, it may well threaten. Click here. Update: Tony Blankley over at the Washington Times, has a different take. Me: I think both articles need to be viewed together for a full picture,with Hanson offering perhaps the deeper perspective, recognizing as he does the internal Islamist situation in Turkey. Earlier this month Amir Taheri published an important article titled Turkey's Creeping Coup D'Etat. It offers unusually insightful analysis of the Islamist political maneuvering going on in Turkey. In an act that hit front pages in the largest newspapers in Turkey, Susanne Geske [wife of the martyred German man] in a television interview expressed her forgiveness. She did not want revenge, she told reporters. “Oh God, forgive them for they know not what they do,” she said, wholeheartedly agreeing with the words of Christ on Calvary (Luke 23:34). The Associated Press tells the story of the slain German missionary and his surviving family here. To my mind, modern heroes. Christian Publishing House Attacked in Turkey... 3 Dead! Michelle Malkin has perhaps the more correct headline: Jihadist Attack at Christian Publishing House. This makes me sick to my stomach and nauseous. The Christian workers had their throats slit. When is this violence against Christians going to stop? I don't think it ever will unless there is some sort of dramatic theological revolution within Islam. Religion of peace? That is a sick, cynical, verbal joke foisted on the ignorant. The so-called "moderate" Muslims, but for a few exceptions, are cowering and silent. They know what kind of "peace" they will experience if they speak out against the violence. It will be the peace of the grave. I am in the process of reading Brigitte Gabriel's book Because They Hate. It is gripping, sad reading of Muslim terror and killing against Christians in Lebanon.